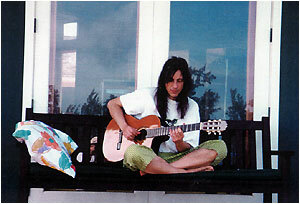 Jesse Gress tours and records with Todd Rundgren and the Grammy®- nominated Tony Levin Band. A respected performer, music educator, and former music editor of Guitar Player, Jesse has hundreds of transcription folios and magazine articles to his credit, as well as five acclaimed reference books: Guitar Licks of the Texas Blues-Rock Heroes, GuitaRevolution - Lessons from the Groundbreakers & Innovators, The Guitar Cookbook, Guitar Lick Factory, and Guitar Licks of the Brit-Rock Heroes. He currently creates content for Guitar Player. 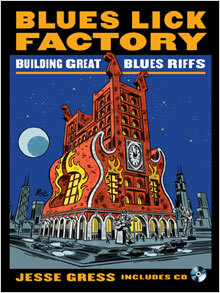 Jesse's sixth book BLUES LICK FACTORY: Building Great Blues Riffs is now available for online purchase. See below for details on this and other books. New dates will be announced as they are confirmed. We are happy to announce that The Guitar Cookbook has gone into it's third printing! Thanks to all of you who purchased the book. The typos have been corrected in the second edition, but for those of you with the first edition, we'll leave them posted below. If you purchased one of the early copies, click here for the changes. Thanks to the eagle-eyed readers who pointed these out! I will personally hand-correct all copies that were ordered from this site. 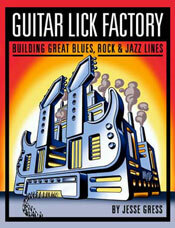 Continuing his series of "more-bang-for-your-buck" instructional guitar books, Jesse Gress presents Blues Lick Factory: Building Great Blues Riffs, an expanded supplementary edition designed to enhance the blues section of his acclaimed Guitar Lick Factory.Beginning and intermediate players who are new to the series can explore a compendium of modular, gig-ready blues licks designed for maximum compatibility, put them to use over every chord change in a standard 12-bar blues progression, and eventually graduate to devising their own complete on-the-fly solo choruses, while those who already own Guitar Lick Factory will benefit greatly from the expanded content and audio versions for every example included on the accompanying MP3 CD. Trade paperback, 9" x 12", 144 pages + MP3 Formatted Disc! Compatible with all MP3 Players and Computers. They scream, wail, and whisper. They wring every possible emotion out of their six strings. 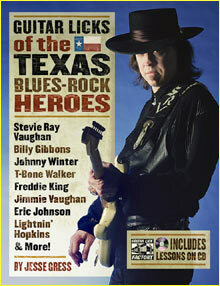 They're the Texas Blues-Rock Heroes, and now you can learn how to play just like them! With enough hot licks to set the whole Lone Star State afire, Guitar Licks of the Texas Blues-Rock Heroes details the solo styles of these legendary guitarists, complete with essential stylistic details that make the music come alive. You get it all, from pioneers like T-Bone Walker, Freddie King, and Lightnin’ Hopkins, through the next generation of innovators like Stevie Ray Vaughan, Billy Gibbons, and Johnny Winter, and on to latter-day explorers like Eric Johnson. You’ll learn more than 100 licks in the authentic style of each player, each lick with its own mini-lesson, performed by the author at a reduced tempo on the accompanying CD. Trade paperback, 9" x 12", 116 pages + CD. Learn the essential licks of three guitar legends: Eric Clapton, Jeff Beck & Jimmy Page. This must-have guide details the solo styles of three guitar greats-Eric Clapton, Jeff Beck, and Jimmy Page. Written by Todd Rundgren/Tony Levin guitarist Jesse Gress, the book explores 100 essential licks derived from the artists' legendary live shows. Offering invaluable insights into each player's style, every lick features its own mini-lesson and is performed by Jesse on the accompanying CD. Trade paperback, 9" x 12", 112 pages + CD. Created for anyone who hungers to increase their command of the instrument, The Guitar Cookbook is a comprehensive handbook that will help beginning, intermediate and advanced players understand the mechanisms of music on the guitar.This collection of "recipes" unlocks the logic of the fingerboard with hundreds of musical examples and concepts that can be applied to any style of music. You'll increase rhythmic, melodic, and harmonic awareness, develop a personalized musical vocabulary, and discover new flavors and fresh techniques that will make your playing sizzle. Beginners will gain solid grounding in the basics, while experienced players can break out of familiar patterns and cliches.Step-by-step, this user-friendly handbook covers all the ingredients for cooking up great music in any genre. 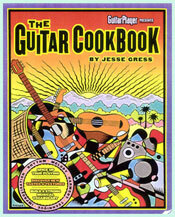 The menu includes music notation, tuning and intonation, rhythm, melody, harmony, ear-training, technique, and improvisation -- a cornucopia of musical information designed to unite the fingerboard.The Guitar Cookbook spices up the learning process by promoting individual taste and personal style. You create your own melodies and harmonies. You write your own chord book. You become your own teacher. Dig in and bon appetit! Soft cover, 9" x 12", 256 pages. There's nothing like the feeling you get when you add a new guitar lick to your musical vocabulary. An encyclopedia of hip lines, Guitar Lick Factory helps beginning and intermediate guitarists build their lick repertoires. In addition, it opens the door to jazz for blues and rock players of all levels, gives jazzers the key to authentic blues and rock sounds, and shows the important connections among all three genres. Guitar Lick Factory contains hundreds of ready-to-play licks presented as short melodic modules. Using Jesse Gress's ingenious grid system, you'll learn how to extract dozens of melodic, harmonic, and rhythmic variations from each module. As you find new ways to combine and mutate these licks. 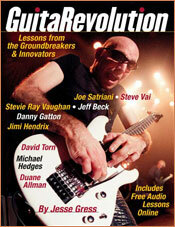 GuitaRevolution: Lessons from the Groundbreakers & Innovators explores the styles of some of the most influential 6-string pioneers. Drawn from the pages of Guitar Player magazine, many of the chapters feature in-person private lessons, while others offer solo transcriptions and lick-by-lick style instruction. ...and much more. As you immerse yourself in the work of these masters, you'll learn licks you can use at your next gig while unlocking your creativity for ear-opening explorations of your own. Includes free lessons online. 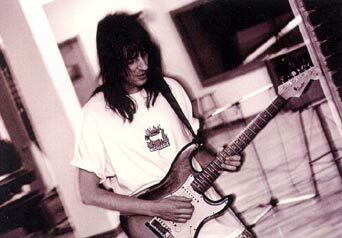 sessions for Todd Rundgren's "With A Twist" album.